Posted on December 28, 2014 at 1:11 am. Editor’s Note: It was a day full of ideas, stories, and overall energy. A week ago, the GeriActors and Friends hosted their annual Holiday party, featuring a performance storytelling workshop, presentations by students in David Barnet’s intergenerational theatre class, and a work-in-progress play by the GeriActors and Friends entitled “Welcome to Our World”. Here is a blog post by Bill Yong about the event. The GeriActors and Friends Holiday Party is a time we open our doors and invite everyone into the world that we create and play in. It started with some introductions. Everyone in the room collectively shouted their name into the middle of a circle and then introduced themselves to everyone. “We all wear glasses, we’ve been to a post-secondary institution, we all believe theatre has the power to make change” these were the conversations people were having, making introductions and finding things in common with each other. 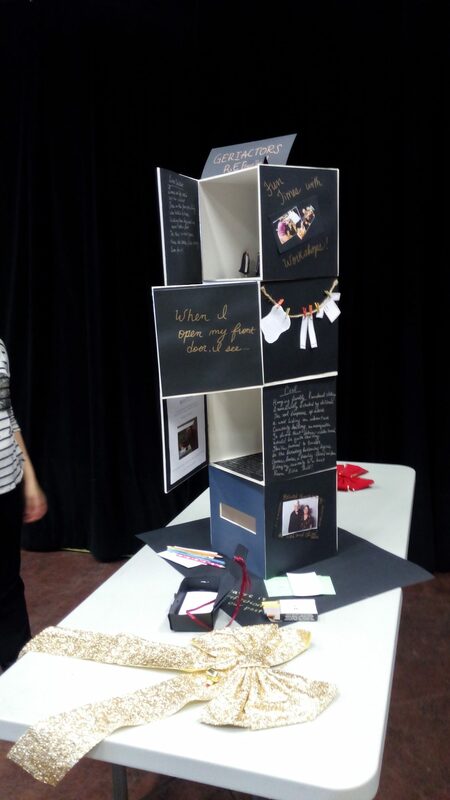 An art project by Francis, one of the students featuring her experiences with the group. Later we shared two-minute stories. Starting with the prompts, “A time you almost got in trouble” and “A journey you had taken” one person shared a story while the second would listen for two minutes. It was interesting observing the symbiotic relationship between storyteller and listener. Both needed each other, the storyteller needed the support of the listener while the listener needed the storyteller’s story to sustain their curiosity. This made me curious about the different physical and verbal ways a listener can support a storyteller. How does a storyteller nurture that support into the delivery of their story? After both people shared, the groups came together to create a moving tableaux from one of the stories shared. It was remarkable watching all these stories come alive in such a short amount of time. After these initial activities, we had our famous GeriActors coffee break with treats, hot drinks and great conversation. A series of short presentations by students in the intergenerational class were given following the coffee break. There was an installation/poetry performance, a queer theatre company proposal, a reading from an excerpt in a memoir based on a student’s grandparents entitled “I Killed Hitler”, and a short read of a play inspired by the GeriActors featuring actors from the company. Lastly, the company performed our work-in-progress play entitled “Welcome to our world” and had a talk back. The talk back provided us with incredible new insights and questions, a common feature of GeriActors Holiday Party talk backs. What is the GeriActors style of working? Someone proposed it wasan active collective model: every member is constantly looking for ways to make offers and support each other in rehearsal, whether actively participating or not serving as an engaged audience member. What is it that allows an inanimate object like a dead fish to have a voice and enhance the story at the same time? Is it the element of surprise? Is it the presence of a different perspective? Lastly, what can we do to support this intergenerational work? How do we get more students to enrol in the intergenerational theatre class as the University is making budget cuts? How do we allow students to see the value of this experience and the importance of this conversation? It seemed like these questions bred other questions, and we left the holiday party with curiosity and a lot of work ahead of us in the coming year. Posted on December 4, 2014 at 2:04 am. 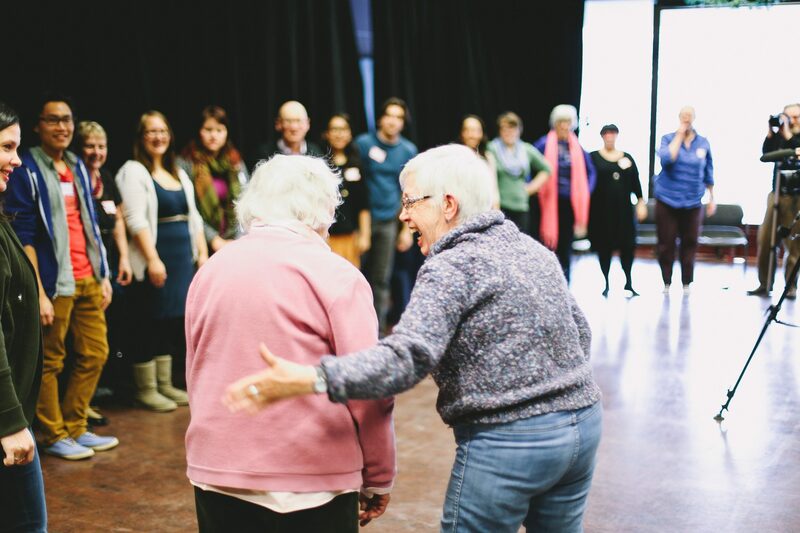 Come join us for a workshop, delicious foods and a performance by the GeriActors and Friends this Friday. All are welcome and its free! Posted on December 3, 2014 at 4:43 am. Editor’s Note: The GeriActors and Friends had a chance to dance with Amber Borotsik this Tuesday afternoon at SAGE. If you have the opportunity, please drop by Tuesday, December 9 at 1pm in SAGE for another movement workshop with Amber. All abilities and ages are welcome! Here is a short post by Bill Yong about a moment in the workshop on Tuesday. What started as a simple adaptation turned into a beautiful piece of choreography. Here is Helen Klemm and Amber Borotsik during a “Flocking” exercise. Posted on December 2, 2014 at 5:34 pm. This week the GeriActors and Friends had an opportunity to work with Mrs. Edith Mitchell’s drama class at Jasper Place High School in a performance storytelling workshop. Here is a post written by Bill Yong about his experience. We walked into an auto mechanic turned drama classroom. To our right was a table full of delicious food: homemade brownies, fruit cookies, hummus, dips, fruit trays, vegetable platters, puffed wheat squares, and angel food cake – all prepared by the students. To the left was a circle of chairs. We began by sitting in a circle and introducing ourselves. Afterwards, we created tableaux based on stereotypes about seniors and young people, shared stories about “our first jobs” or “a time we got into trouble” and created scenes from them. It truly was full and busy two and half hours. Something that caught me by surprise was how empowered these students were. Each game, prompt, and activity was facilitated by a student, in fact, the whole workshop was run by the students. These students had skills I had not developed until recently: listening for time, asking open questions, and the most important, having excessive amounts of good food for coffee break. A question began to percolate my brain as I watched the different intergenerational stories being performed. What is it that makes it possible for a 16 year old high school student to be able to play an 84 year old senior? How are they able to capture the details, nuances and energy of a character who is over 60 years older than them? I think the most authentic storytelling comes from the people who have lived the experiences themselves. These students lived these stories, they know the characters that they are playing, and if there are missing pieces, they are familiar and comfortable enough to fill in the gaps. Authenticity and honesty are key to the work that we do in performance storytelling. As facilitators, what are the prompts, questions,and exercises that open up these channels of memories for us? Another reason is the students’ commitment to the characters. In the moment they played the scene, the 14 year old student fully believed and embodied the 84 year old woman she was playing. She never questioned her presence and neither did any of the audience. A beautiful piece of acting. How does the facilitator develop a space that inspires this ingenuity? These are lessons we ought to remind ourselves of in doing this work. Thank you Jasper Place High School and Mrs. Edith Mitchell for the wonderful afternoon.